If you find errors, problems or want to contribute please add a comment. You should check the GnuPG documentation for more information on the process. When asked what keys to create, select RSA and RSA (default) and choose 4096 bits as a key length. Note that building TclGPG from source requires some files from the Tcl development package. Button (1) on the toolbar to sign your presence and messages. Button (2) on the toolbar to encrypt the conversations when possible. 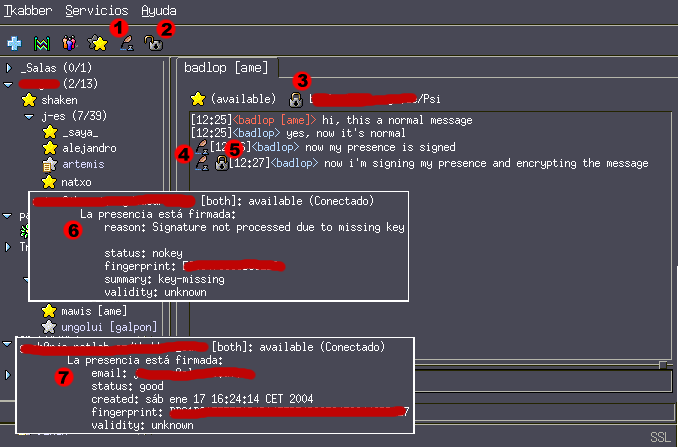 Button (3) on every chat window to send your messages encrypted if possible. Icon (4) indicates the message is signed. Icon (5) indicates the message is encrypted. Text (6) appears when a contact is signing its presence but you can't verify it. Text (7) appears when you have verified its presence. The first time Tkabber tries to use GPG it will ask you for the key to use and the passphrase. When a contact in your roster signs its presence, you will see some info on his tooltip on the roster (6). To verify your contacts signatures (7) you need to add his public key to your ring. GnuPG: The GNU Privacy Guard Official site with source code download and documentation in multiple languages. Submitted by teo on Sun, 01/18/2004 - 20:08. I would like to make a small correction: Tkabber signs not only presence but also messages, so icon 1 at the picture means "Sign presence and messages", icon 4 shows that the message is signed. Submitted by Anonymous on Mon, 01/19/2004 - 02:04. I can`t see the information about signing etc... when my mouse is over the rosteritem, just the JID or, if activated, the client and OS, but no GnuPG information. What line do i have to put into config.tcl to see that? Submitted by teo on Mon, 01/19/2004 - 07:39. It could be in two cases: 1) presence is not signed; 2) your Tkabber is outdated and should be upgraded. Submitted by Anonymous on Tue, 01/20/2004 - 16:44.
ad 1.) My presence is signed, i get asked for passphrase of the right key at startup and others see the "feather" in the conversation, just like i do. Submitted by teo on Tue, 01/20/2004 - 17:44. So, you have to wait until Debian maintainer make 0.9.6 available in deb. Submitted by Anonymous on Mon, 05/10/2004 - 14:17. Submitted by teo on Sun, 08/15/2004 - 15:57. Debian package of tclgpgme for unstable branch is available at http://sgolovan.nes.ru/debian/sid/. to /etc/apt/sources.list and use APT to fetch and install package tclgpgme. Submitted by hs on Tue, 01/19/2016 - 20:22. Aparrently Tkabber now (1.1.2) depends on TclGPG instead of tclgpgme as per official documentation (http://tkabber.jabber.ru/files/doc/tkabber.html#s.requirements). Submitted by teo on Tue, 01/26/2016 - 06:53. You're right. This tutorial is a bit outdated (though the screenshot looks fine even for now). I'll fix it shortly.